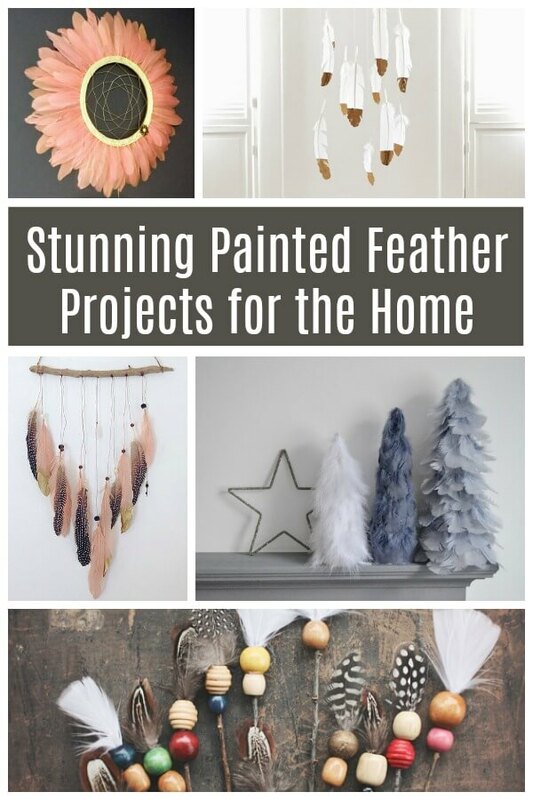 If you want to make these projects, brush up on how to paint feathers. You have many options and can likely use what you have on hand. We shared how to paint or dye feathers using watercolors and so many people didn’t know how easy it is! 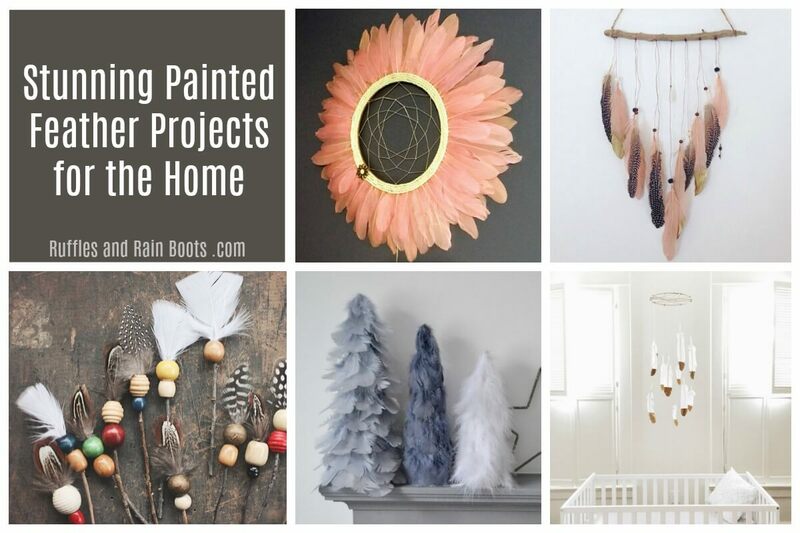 The fun we’ve had when sharing how to paint feathers with paint pens resulted in so many fun kid crafts and decor projects. Using acrylic paints to paint feathers isn’t hard but it does change the texture of a feather dramatically. This quickly-painted feather mobile adds a luxe leather and gold-tipped accent in no time at all. Need a quick pop of color? You don’t even need to paint the feathers yourself! Grab a bag of dyed feathers and in just minutes, you can have this colorful painted feather decor addition to any room! If you find yourself at the beach, pick up a piece of driftwood and make this beautiful Bohemian painted feather wall hanging. The possibilities are endless. 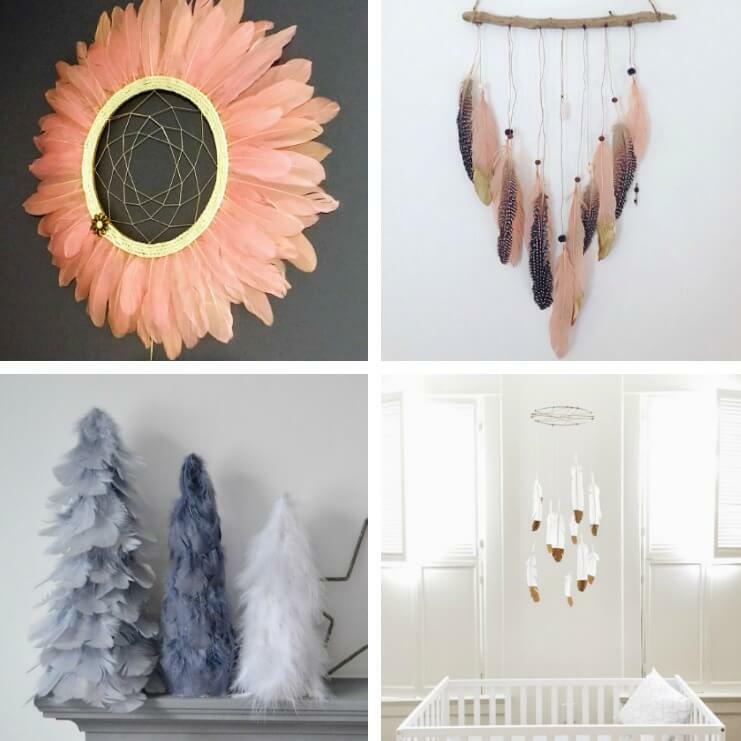 Looking for a fresh take on a dreamcatcher or don’t like the dangling strings because of safety concerns? This is a beautiful juju style painted feather decor dreamcatcher. This is a stunning piece of painted feathers and I can honestly say I’ve never seen this done before. Depending on how you place it, it could be a sun, a flower, or a mandala. Simply amazing. The holidays never looked so good! These painted feather Christmas tree cones are easier to put together than I thought! Get the tutorial and be prepared to glam up the holidays. Soooo… Technically, these aren’t painted but hear me out. Create a place setting with one of these easy rustic arrows using wooden beads and a painted feather to fit the theme. Instant rustic or Boho vibes. What’s your favorite way to use painted feathers in decor? Dreamcatchers (even clay dreamcatchers we make) are probably the most prolific way I use them. Would you please pin this to your favorite decor board on Pinterest or share it on Facebook? Your shares are how we grow and we sincerely thank you for them. These are absolutely stunning. Love seeing your work!